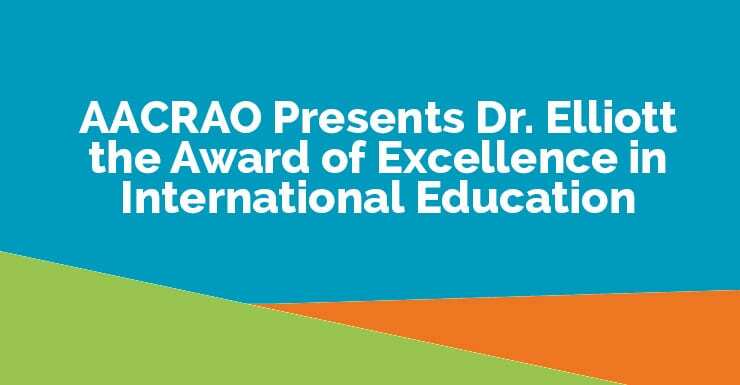 Chapel Hill, NC – enrollmentFUEL is pleased to announce that Dr. Jacquelyn D. Elliott was presented with AACRAO’s 2019 Award of Excellence in International Education at their 2019 annual national meeting. The award is presented to a member who has demonstrated a commitment to internationalism and has made an impact both on the profession and on those who serve it. Dr. Elliott has over twenty-five years of experience and a diverse background in higher education, including Academic Affairs, Institutional Advancement, International Education and all aspects of Strategic Enrollment Management. Along with currently serving as president at enrollmentFUEL, she conducts faculty development training for leaders of universities throughout the Kingdom of Saudi Arabia under the auspices of the Academic Leadership Center (ALC) of the Ministry of Education. She was the first female faculty appointment at the all-male King Fahd University of Petroleum and Minerals (KFUPM) in Saudi Arabia. She has also led faculty development, accreditation consultation, and USA faculty/student exchange in Kuwait and Oman. Her current research focuses on women and leadership in the USA and Saudi Arabia as well as enrollment management. enrollmentFUEL is on a mission to create more effective and efficient Student Search communications and strategies. The company has extensive expertise in geo-demographic research, predictive modeling, creative design and messaging, CRM implementations, and all aspects of digital advertising (IP targeting, retargeting, geotargeting, geo-framing, matchBACK™, etc.) With proprietary technology and innovative thinking, enrollmentFUEL provides successful outcomes and actionable insight to the people who recruit people. For more information, please visit enrollmentfuel.com. at 919.306.8122 or email at mike.wesner@enrollmentfuel.com.